A few years ago, a good friend of mine was diagnosed with lung cancer. I had heard of quilts that you make with pockets that could be filled with cards, good wishes, prayers, little gifts that the cancer victim could take with them to the hospital when undergoing treatments. They could use it to cover up with as well as read the messages during their treatment. So I contacted her family and friends to get cards and messages to fill the pockets and started making the quilt. She loves crazy quilts and batiks, so I made pockets of all types using scraps of batiks and trimmed them with decorative trims. It got pretty crazy all right! When finished and filled it was sort of heavy and cumbersome, but filled with love. She loved it!!! I hope it helped her feel the support and love of her family and friends during her long ordeal of radiation and chemo. She is a cancer survivor! 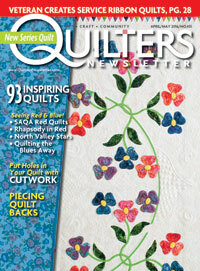 Go to the Amy's Blogger's Quilt Festival and enter your quilt as well as visit some of the other participating blogs. What a great idea to add the pockets for messages. My quilt for this festival is for my Mom who is undergoing chemo right now so I know what these quilts mean. I love the idea of adding pockets for messages...what a great quilt! Best wishes for continued good health to your friend! What a great idea and such a lovely quilt. So glad to hear that your friend is a survivor. What a lovely quilt and so special. It's amazing how many of these quilts are made with love to help heal a sick person. They really do have a special energy. I also love the bright colors to raise someone's spirits. Great job! 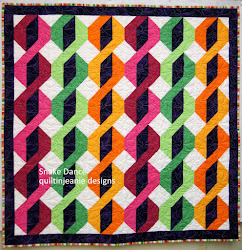 Hooray for the dear friend you are to make such a darling quilt, and hooray for your friend being a survivor! Love, the best part of a beautiful quilt! What a wonderful quilt and a thoughtful gift. i've never heard of a quilt with pockets! It's so sweet, brilliant! love those smashing batiks! It's a fantastic quilt, a heartwarming story, and continued good health to this cancer survivor! Well done, Jean. I LOVE the variety of trims on the blocks. How very clever! And beautiful, too! I will have to save that idea! That is such a lovely idea. I'm sure oyur friend appreciated it. You did a greta job. That is a really good idea...and the quilt is bright and cheerful! Jeane, this is an awesome blog. I love this quilt. Wonderful. Thanks for sharing. What a wonderful idea! Your quilt is quite stunning and so colorful. It would certainly brighten anyone's day! I still haven't posted for the Quilt Festival, but I'm sure getting a lot of inspiration! Terrific idea! Thanks for sharing your lovely quilt & story. What a wonderful story. Seeing all the quilts is great but hearing the stories behind them is even more inspiring. Thanks for sharing. OOH Mom, I love the batiks. I hope all the people who come here for the festival look at your other quilts too. What a wonderful story behind this clever quilt! Well done for making such a special gift to help your friend in a tough time! Beautiful! The pockets are a wonderful idea - what a beautiful quilt and gift. Thanks for sharing your quilt and story. Awesome quilt, and a great idea for the messages. Your friend is blessed to have someone like you to make such a beautiful treasure. That is a lovely idea, and gives me ideas! My girlfreind had Breast Cancer a while ago.. and everyone who knew her and quilted made a block with a pink heart in the centre, and they were all sent to her to make into a quilt... it came out BEAUTIFUL. And she made a full recovery too, which was fantastic. 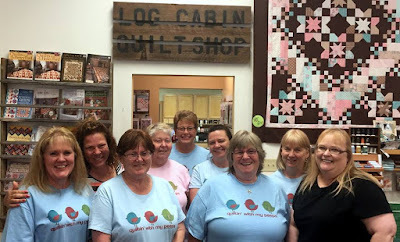 Thanks for sharing your quilts story. The pockets are such a nice idea. I love batiks and this pattern really shows them off. This is a beautiful quilt. I love the batiks and the pockets for messages is a novel idea. I am sure your friend loves it and finds comfort from it as well. Thanks for sharing. what a lovely gift! so pretty and so kind. A wonderful energetic quilt and so full of love...great idea! The pocket idea is terrific. I like that many people contributed cards and notes to tuck in the pockets. This is such a wonderful story and you have such a giving heart. I like the pocket idea. What a fantastic idea, it made a beautiful quilt too. What a thoughtful and clever gift. I love it! It's a great idea for a birthday or moving away gift, too, isn't it? There's nothing better than a quilt stitched with love and FILLED with healing!!! SUPER job. ; ) Thanks for sharing! Love your idea of adding pockets. Beautiful quilt. Delightful quilt. 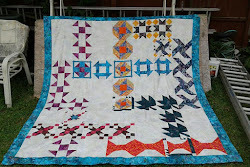 Thanks for participatng in the Bloggers' Quilt Festival. What a beautiful quilt and a brilliant idea. I love batiks. They just make me feel young and playful. What a fabulous quilt -- and a great story behind it!! What a very sweet idea. Very lovely quilt. A beautiful gift with wonderful heart behind it!! It is a beautiful quilt and a great idea to add the pockets for notes. I am so happy to read she is a survivor. A beautiful quilt, and I love the idea with the pockets! I've not heard of a pocket quilt, but what a fabulous, thoughtful gift for someone facing a tumultuous situation such as cancer treatments... It is lovely! Lovely and cheerful! What a good idea! when I was undergoing chemo, there were some soft throws that we used during the chemo and I remember it being a comforting feeling. How much more special to have something made with love to keep and with pockets of good cheer! I've never heard of or seen a pocket quilt before - what a neat idea! I love the craziness of yours!! The pockets for notes are so cute. What a lovely idea. I like it the quilt very nice. I love the bold colors and what a great story! i am sure the quilt helped your friend! Cute kitty and Heather's giveaway!!! If I don't have a picture can I still post?